Since approximately 1998, thousands of people started noticing airplanes spraying parallel lines, and grid patterns across our skies. These trails initially look like contrails but actually are not. According to the U.S. Air Force, contrails are condensation trails and happen when hot engine exhaust momentarily condenses ice crystals into pencil-thin vapor trails that quickly vanish like the wave behind a boat, very much like your breath when talking outside on a cold winter day. 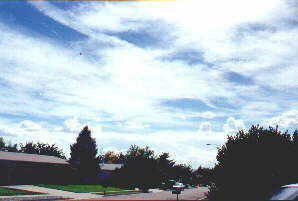 Geo-engineered Geo-engineered chemtrails, on the other hand, linger for hours and will spread out to form large areas of cloud cover. 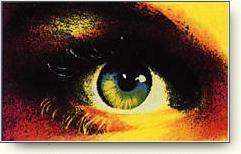 There are several theories as to why these operations may be occurring. However, most of the documentation available points to geo-engineering and space weaponry as the reasons that these spray operations are occurring. A concept that keeps popping up in major governmental studies is the idea of spraying aluminum oxide particles into the atmosphere to create a sunscreen. This concept is exactly what respected scientist Edward Teller, the father of the H-Bomb, called for in 1997 while at Lawrence Livermore National Laboratories. In a government-sponsored report called Global Warming and Ice Ages, he suggested the scattering of 1 million tons of materials into the atmosphere in order to reflect 1% of incoming sunlight. He states that it would be cheaper to slow global warming through "stratospheric deployment of oxide particulates" than to actually slow down greenhouse gases connected with fossil-fired energy production. The sunscreen concept is also called for in a major congressional study titled Policy Implications of Greenhouse Warming, which was sponsored by the National Academy of Sciences, National Academy of Engineering, and the Institute of Medicine. This huge study was reported in 1992 and is the textbook on greenhouse gasses, global warming, policy decisions and mitigations. In this study, they discuss spraying the atmosphere with stratospheric dust or soot and to simulate clouds in order to mitigate global warming. The study also suggested dumping iron into the ocean to stimulate plankton that could potentially eat carbon dioxide. As reported by CNN, Moss Landing Marine Laboratories recently dumped iron in the Pacific Ocean to do just that. You can see that these are not just theories, but they are theories in actual use. But dumping iron in our oceans backfired when a large amount of fish died. So what are the unreported consequences of mass spraying the atmosphere? Ken Caldera, also from Lawrence Livermore National Laboratories, is a concerned scientist who said that this type of spray operation could have grave environmental consequences and could cause serious health concerns. But it seems they cared nothing about Mr. Calderas concerns. Our children are now even being taught this aerial obscuration concept in our schools. In the level one science book, "Essential Interactions" by Centre Point Learning, Inc., a photo of a jet is titled "Particle Air" and has the caption "Jet engines running on richer fuel would add particles to the atmosphere to create a sunscreen." This is in the section titled "Solutions for Global Warming. "In the same section they also show a picture of a helicopter dumping iron into the ocean as a way to mitigate global warming, as we mentioned earlier. Again, CNN actually reported the iron theory being carried out. These are not just theories. Not only do the governmental studies support this sunscreen theory but there are also actual patents that have been issued for devices to carry these operations out. One important patent is the 1994 Welsbach patent issued to the Hughes Aircraft Co. It is for atmospheric spraying with aluminum oxide to reduce global warming by seeding and reflecting 1% of incoming sunrays. It so happens that aluminum consistently turns up in chemtrail related lab test results. Another patent worth mentioning is the 1975 US Navy patent, which is for a contrail generation apparatus for producing powder contrails. In the summary section it clearly states the term 'contrail' was adopted for convenience in identifying the visible powder trail. "It appears they are still using the word contrail for convenience. The people carrying out these types of operations will never use the word Geo-engineered Geo-engineered chemtrails. 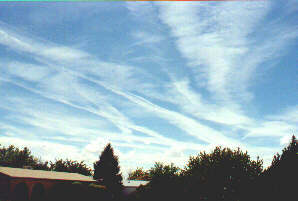 They use terms such as aerial obscuration, persistent contrails, or sky soot. But Dennis Kucinich did use the word Geo-engineered Geo-engineered chemtrails in the Space Preservation Act of 2001 in which he tried to ban Geo-engineered Geo-engineered chemtrails and other space-based weapons. He wrote the bill, also called H.R. 2977, while he was the head of the U.S. Arms Oversight Committee. The bill calls for a ban on space-based weapons and a ban on the types of operations that were seeing happen now. 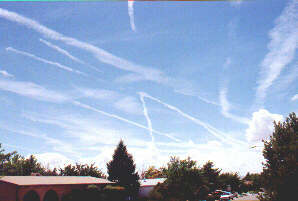 In section 7 of the bill, Geo-engineered Geo-engineered chemtrails is considered an exotic weapon. Space-based weaponry is another likely reason that these operations are occurring. As is stated in the Air Force study Owning the Weather in 2025, it is a major advantage to modify the weather and cause rain or drought for the enemy. 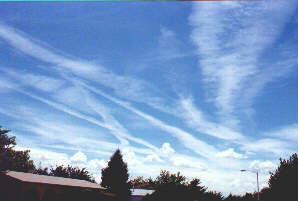 They also find that the spraying of certain chemicals in the skies assist to jam radar and tele-communications systems. They go on to say that these activities could have tremendous potential in times of military aggression and are pleased that these tactics could also have enormous psychological potential, which would be just as beneficial. The study even goes on to say that one major advantage of using simulated weather to achieve a desired effect is that unlike other approaches, it makes what are otherwise the results of deliberate actions appear to be the consequences of natural weather phenomena. These operations are also advantageous to the HAARP, which stands for High Frequency Active Auroral Research Program. HAARP is a highly funded research project in Alaska focusing on altering and manipulating the atmosphere for weather and military dominance. The US has a long history of spraying chemicals on innocent people in this country. The Freedom of Information Act has allowed us to access information about these experiments, including the spraying of biological agents over San Francisco in 1950 to see who came in sick at local hospitals. This is just one example of many. Just recently in 2001, Captain Joyce Reily stood against the military's open air germ testing. There are many more examples in the history of aerial spray operations that you can read about on the website Geo-engineered Geo-engineered chemtrails911.com. 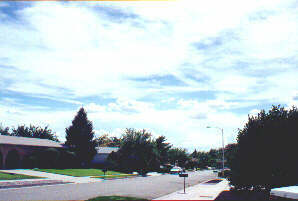 In 1997 and again in 2000, U.S. Title 50, Section 32 was actually revised to allow for exceptions in conducting experiments on unwitting citizens. Unfortunately, the goals of this activity are not known with absolute certainty because when high level officials are asked about these spray operations, they answer that what we are seeing is just normal. When concerned pilots and Air Force personnel ask their superiors questions relating to these operations, their concerns are met with replies like this information is on a need-to-know basis or they are given special misinformation to make them think they are doing their patriotic duty. Concerned civil servants are also being told that speaking out on this issue will violate national security and that they will be held accountable. These operations cause us to have great concerns. We do not like being part of a secret spray operation without our consent. We are very worried about the health implications of spraying chemicals that are on the OSHA hazardous list. And the fine talcum powder-sized particles they call for to be sprayed are very harmful to our health according to the American Medical Association. If this is truly being done to mitigate global warming, as research indicates, then don be fooled into thinking that this is for our own good. This is not for our own good! We are breathing this in and unexplained illnesses are occurring. Yes, global warming is an issue, but we should not jeopardize our health and freedom to avoid having to regulate fossil-fired energy use and production or exploring alternative fuel technologies. A sunscreen solution only masks the real problem and isn't a solution at all. The massive health problems and risks involved largely outweigh any possible benefits. These spray operations need to be stopped immediately. And the pictures of jets spraying from.... where??? Engine vapor??? Right...! 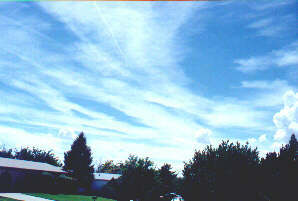 Geo-engineered Geo-engineered chemtrails vs Contrails: Do YOU know the difference? Population Reduction: Think genocide... and population control, among other things! More Detailed Information on Geo-engineered Geo-engineered chemtrails!